What we are saying, the newspapers would not dare print, began Baudelaire in the Introduction to his Salon de 1845. “Advertisements for the 2008 Whitney Biennial promise a show that will tell us ‘where American art stands today,’ although we basically already know." If we already know why bother unless, like Cotter, we’re not interested in seeing something new, just in proving that we already know what we’re about to see? Cotter explains that “a lot of new art” can already be seen elsewhere, which is the kind of Timespeak that should be banned alongside aerosol cans and plastic bags: did a hundred trees have to die so we could learn that there’s a lot of art in the galleries? And shouldn’t the Whitney aim to show us ‘umble rubes the kind of art we haven’t seen before? Art that can’t be found in the ho-hum galleries? In the ho-hum Times? Cotter continues: “This year we have a Whitney show that takes lowered expectations...as its theme.” But if the critic has no expectations to begin with, how can those be lowered? By “lowered expectations” Cotter means the “iffy economy” that the Biennial supposedly takes as its theme. Likewise, if this were the biennial Salon of 1851 we'd notice that a lot of realist art was on view that happened to look like the art we saw all over Paris. But then, once we’d approached the artworks on display we'd see that Courbet’s realistic painting of Stonebreakers took despair or disappointment as its theme. Or again, we might be thrilled that the art of Realism, the art we already knew and loved from frequent sightings, was given pride of place at the Salon. And we might in turn, once we examined the works on display, see Courbet’s Stonebreakers as a message of hope. Our prior understanding of the concept of Realism, negative or not, would determine how we approached the Stonebreakers: it would help us determine whether or not Courbet had understood the concept and built upon it. It seems that Cotter classifies the works at the 2008 Biennial according to two distinct functions: diachronic engagement and synchronic engagement, the relationship of the art-world to its social basis and the relationship of the artwork to is anticipated evolution. On the one hand the art on view is supposedly a faithful reflection of all art going on everywhere – by which Cotter means “in certain galleries and fairs.” On the other, the art on view is a faithful reflection of economic anxieties over the future; but of course if the art on view is only the reflection of the kind of art you see in galleries and fairs and in advertisements in the New York Times then the economic anxieties that are the underlying theme of the Biennial are only the reflection of the economic anxieties of those who buy and sell and write about the kind of art that’s advertised in the New York Times. The Economy plays for Cotter the same role that theories about Realism played for audiences and critics in 1851. Simone de Beauvoir tells how black became the fashionable color among the in-crowd. It seems a group of bohemians congregated around Saint-Germain-des-Prés in the ‘sixties, whose interest in self-expression was in reverse proportion to their interest in politics: most, in fact, were children of wealthy Vichy supporters eager to distance themselves from the stain of collaboration. One summer a group of them traveled to the Riviera, where they met a group of equally alienated young Italian fascists who still kept to the fascist avant-garde's dress code of black turtlenecks and straight black dresses. This style the French bohemians brought back to Paris, where it was popularized by the existentialist Goth singer Juliette Gréco. Fashionable despair. It's the new black. Could be the old black as well. 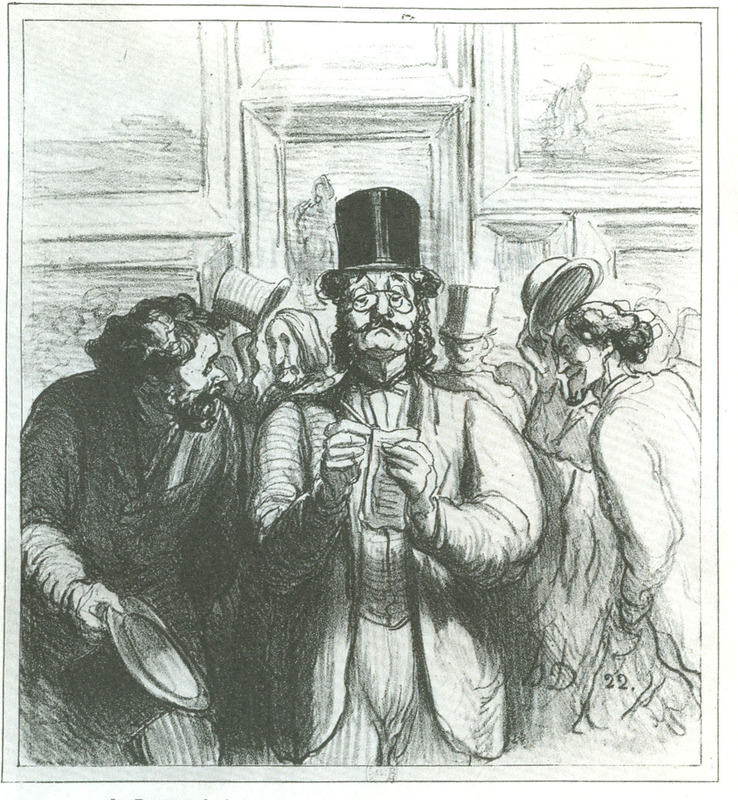 And another thing about the newspapers' art critics: they remind me of a participant in a museum lecture of mine, once, who informed me that the Manet I was discussing was not at all like the Manet he knew, and could we move on? "As I slogged through the Whitney's amorphous, random and mostly incomprehensible Biennial, a line from T.S. Eliot's "The Wasteland" echoed in my brain: 'These fragments I have shored against my ruins.'" Ironic, considering what’s incomprehensible about Eliot: not the arcane fragments of “real” literature, which are usually explificated in a footnote, but the pieces of pop trivia; not the pieces of pop trivia themselves but the ambivalence of Eliot’s attempt to connect with his fantasy reader: waspish, classicizing, refined, and quite above all of this low-life trivia. There’s an unconscious irony in Eliot’s conscious irony, just as there is in today’s art at the Whitney, but then Eliot and American art criticism both strive, like little Matthew Arnolds, to separate the viewers from the crass, material basis of their own culture: what if the Biennial wasn’t about the art in museums and galleries? What if it wasn’t about either the high art rejected by Newsday or the gallery art supported by the Times as it supports the Times in return? "The works before us, we are told, "explore fluid communication structures and systems of exchange that index larger social, political, and economic contexts, often aiming to invert the more object-oriented operations of the art market." In other words: 1) much art deals with the world beyond the studio, and 2) artists are purposely making things nobody would want to buy." Gosh – she says non-commercial as if it were a bad thing. It sounds as if Cotter of the Times and Buddick of Newsday share the same viewpoint: Cotter thinks the show faithfully reflects the economic side of society, and is therefore a Good Show. Buddick thinks the show does not reflect the economic side of society, and is therefore a Bad Show. This here’s not the Manet that Buddick knows. This here’s the Manet Cotter knows. The critics praise or blame the curators for bringing in the artists who either get it right or not: thus paychecks do make cowards of us all. I’ll grant them this in common, though, the critics and the organizers of this show, and even the artists as well, perhaps: the two problematics in play at the Biennial are 1) the specular functions of art, and 2) its economic functions. Those are not the themes ‘round which I’d like to create or display art, but apparently that’s what Whitney Biennials are supposed to do, and it seems as if the curators went along, and the artists went along with the curators – and the critics went along, of course. The more important question now, is how the artists dealt with these issues, and with the issues that arise when 1) and 2) collide. Because I’m not convinced that art should or should not reflect the market, or reflect the values of T.S. Eliot, either. And I’m not convinced that art should, or should not be of the type that’s for sale, and if I were convinced I’d go for sure; not in the hopes of being proved right, but in the hopes of being proved wrong.